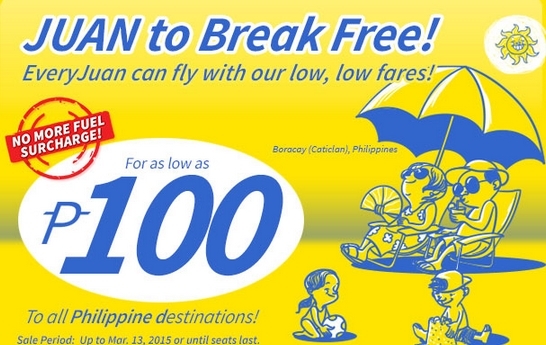 Here is the latest Cebu Pacific Air Promo Fare for domestic flights for 2015!!! Thus new seat sale is for the months of July, August, September, October, November and December 2015. Booking of tickets is now ongoing and will end on March 13, 2015. BASE FARE is sold at 100 Pesos for Domestic Promo Tickets. If you are from Manila, you can book a ticket anywhere in the Philippines for as low as 446.40 Pesos, ALL in!!! The cost covers already the terminal fee (200 Pesos), Cebu Pacific Web Admin Fee (120 pesos per ticket) , and VAT (26.40). This promo offers NO FUEL Surcharge!! Terminal Fee from Cebu is 220 Pesos while other airports charge 50 to 200 Pesos. For Non Manila and Cebu tickets, terminal fee should be paid on the date of flight and will not be included in the price of tickets. Travel Period is from July 1 up to Dcember 31, 2015!! Yes, you can book your promo tickets as early as now for your Christmas vacation!!! LIKE and Follow us on Facebook at WE LOVE CEBU for more promo fares and news here in the Queen City of the South! !